See all Total shoulder CPT codes. Young age, high activity level. (Guery J, JBJS 2006;88A:1742). 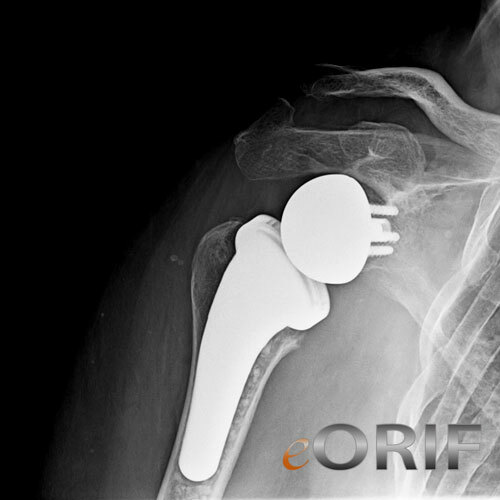 Hemiarthroplasty: consider for patients with AFE>60°, an intact coracoacromial arch and a desire to maintain rotation. Non-operative management: NSAIDs, PT, steriod injections. Most inform patient that reverse TSA will lengthen the arm, and change the contour of the shoulder (not as noticable if Encore prosthesis is used). Evaluate MRI for teres minor atrophy. Stage 3-4 fatty infiltration of the teres minor comprises the outcomes for reverse TSA. (Simovitch RW, JBJS 2007;89A:934). The arm should be lengthened by @2-3cm (tip of the acromion to the elbow) (Gerber C, JAAOS 2009;17:284). Beach chair, ensure unobstructed movement of the shoulder in adduction and hyperextension. All bony prominences well padded. Drill glenoid centering hole in center of inferior 1/3 circle, (length of final center screw is 30mm), ream glenoid (Encore prosthesis). 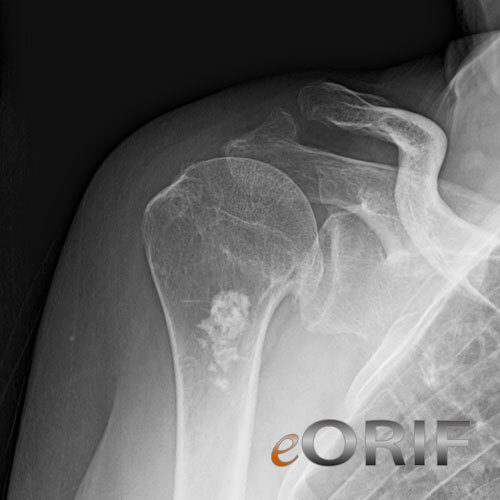 Select humeral component to allow 2mm circumferential cement mantle. Place drill holes and sutures in lesser tuberosity for later subscapularis repair. Cement final humeral component in place. Test stability: dislocation generally occurs anteriorly with the arm in abduction and internal rotation (occurs when getting out of chair or bed). If unstable increase the anterosion of the humerus and ensure glenoid is not anteverted. Repair subscapularis throught drill holes. Prevalence: 47% for revision cases, 5% for primary reverse TSA. (Boileau P, JSES 2006;15:527). Complication rate is approximately 3x's that of standard TSA. Hematoma: most frequent complication in early series. Generally lengthens arm and changes the coutour or the shoulder. Post-op: consider hemovac drain for 1-2 days, Abduction sling. Elbow, wrist, hand and Pendulum ROM exercises. 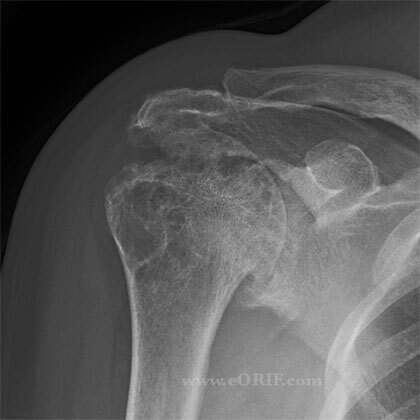 Avoid ER for 6weeks to allow subscapularis to heal. 6 Weeks: Active supine ROM started. Discontinue immobilizer, consider using sling in public/crowds. Generally may use arm for daily activities and driving. 3 Months: activity as tolerated. Adjust home exercise program to any patient deficits. May return to golf. Radiographic results deteriorate after @6 years, clinical results deteriorate at 6-8 years post-op (Gerber C, JAAOS 2009;17:284)..
18% required revision in primary revTSA patiens, 38% revision for secondary surgeries; Depuy Delta III prosthesis. (Werner CM, JBJS 2005;87A:1476). Generally improves active elevation, but does not improve active external rotation or internal rotation.